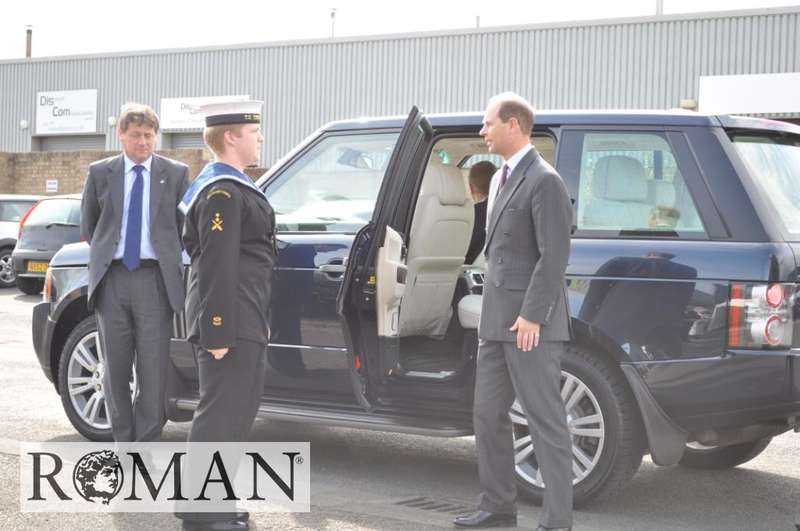 The visit began with the Lord Lieutenant introducing HRH to a number of dignitaries including our Local MP, Phil Wilson and our High Sheriff Roger Howell. Following this company Chairman, Gerry Osborne, was presented to HRH…he and Managing Director, David Osborne, then proceeded to give HRH a tour of our site. 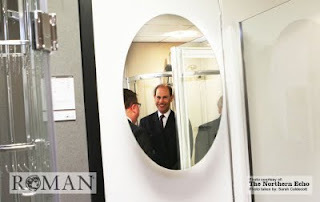 Beginning in the showroom, HRH was shown the finished Roman enclosures. 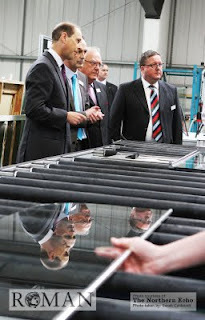 The tour then moved onto our Tray manufacturing plant – HRH was shown how we develop our own shower trays, from direct cutting our own moulds, through to casting, through to hand finishing every single Roman Stone solid surface tray. The next stop was our R&D team, where our Design Manger and the team were presented. 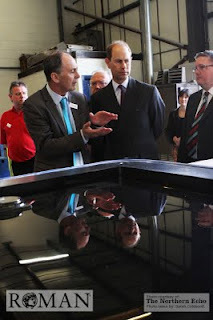 The tour then moved into the main factory where HRH could see the production lines – he did take the opportunity to chat with staff. 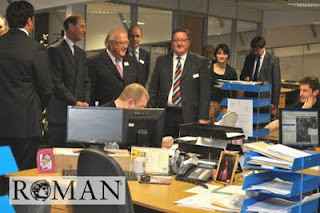 HRH was then taken upstairs into our Customer Relations Centre, where the tour came to an end. 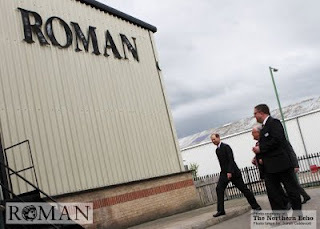 Following the tour all Roman staff gathered in the presentation area where HRH met 4 long serving employees. Chairman, Gerry Osborne gave a short speech to thank employees for their commitment to the company and to thank HRH for attending. 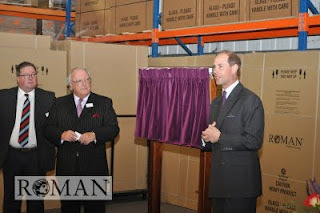 HRH was then asked to give a short speech and unveil the commemorative plaque. 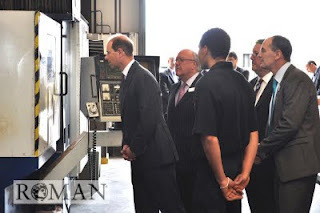 The staff were all really impresses and amused by His Royal Highness’s speech which was funny and engaging – he created a fantastic atmosphere and everybody clapped and cheered as the plaque was unveiled. 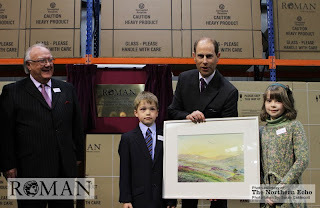 To thank him formally, HRH was then presented with a gift by David Osborne’s children – a painting by a local artist. He was then invited to sign the visitor’s book. 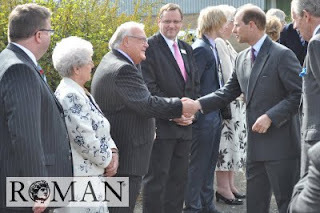 Although at this point he was free to leave, HRH actually went over and started chatting to some of the Roman staff and mingled for a short time – what a fantastic touch. HRH certainly represented the Royal family well! We were all very impressed. To finish the celebrations, after HRH had taken his leave, Roman staff gathered for a glass of wine and were each presented with a 25th Anniversary commemorative hamper pack. 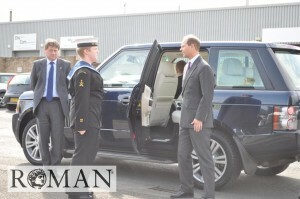 What a brilliant day – we all thoroughly enjoyed it!